WE HAVE MOVED! 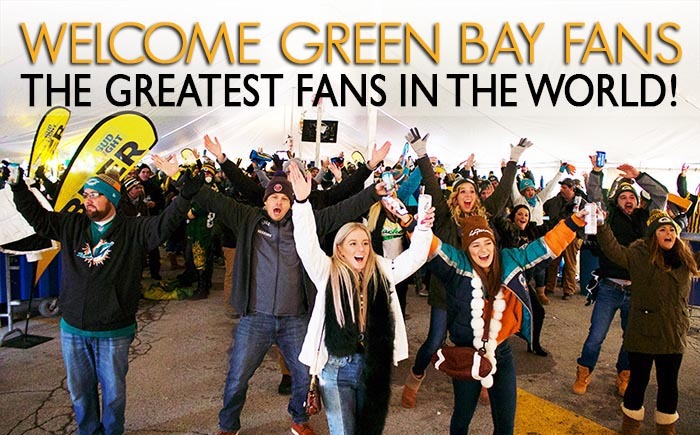 Event USA we are excited to announce that we are now partnering with The Green Bay Distillery on Mike McCarthy Way for our world famous tailgate party! Come join us in celebrating our new tailgate menu including our all NEW VIP indoor area to help keep you warm before entering the Frozen Tundra. With 2 different tailgate party options to choose from, Event USA has your pre-game needs handled! Whether you go VIP or keep it traditional, our Fan Tailgate Party includes an “all-you-can-eat” buffet of traditional Wisconsin “tailgate party” fare! Chow down to your heart’s (and belly’s) content before you pull out your Tickets and enter Lambeau. Starting 3 hours before kickoff, it’s held outdoors just blocks from historic Lambeau Field. Special Children’s admission – Kids 12 and under get a special souvenir! An alumni player to greet fans with autographs available for purchase during regular season games ONLY. There is no better way to kick-off an exciting day of football then by attending our Tailgate! The Party begins 3 hours before kickoff and ends 30 minutes before kickoff. The Traditional Official Event USA Tailgate Party is included in our Silver, BronzeandTicket & Tailgate home game packages. You can also upgrade to our VIP Tailgate when ordering. It’s also available for separate purchase! Custom Pre- and Post-Game Parties Available, Too!